PCL Construction topped out the 23-story Monarch Hotel and Casino in Black Hawk. 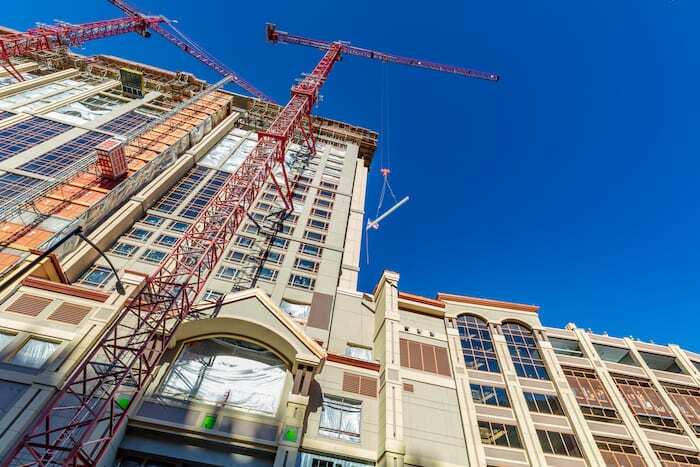 PCL Construction topped out the 23-story Monarch Hotel and Casino in Black Hawk. With completion scheduled for August, the team is working to finish construction of the exterior and interior spaces. The hotel tower will include five lower levels of casino gaming, restaurants, hotel administration and lounges. Levels six and higher will include hotel rooms and suites, and the top level will be an amenity deck with a spa, pools and recreation space. MBA Architecture and Interior Design designed the project. Black Hawk is home to the state’s largest number of casinos. This is PCL’s fourth hotel and casino in the area, including the Lodge Hotel and Casino, Black Hawk Casino by Hyatt, and the Gilpin Hotel Casino remodel. Reno-based Monarch Casino & Resort Inc. bought what used to be the Riviera Black Hawk casino in 2012. Published in the Jan.2-15, 2019, issue of CREJ.